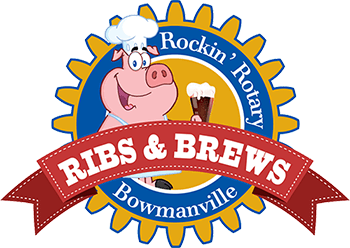 The Rockin' Ribs & Brews Festival is the Bowmanville Rotary Club's major fundraising event. This year is going to be the best ever with something for everyone - a children's stage, midway, an enhanced craft brew area with its own stage, the rockin' main stage, vendors of all sorts, and, of course, our renoun ribbers serving up the best ribs ever. There is no better way to have a great family time and to support you community at the same time. For complete information and to stay up-to-date with the plans, please visit the Bibs & Brews Website or like us on Facebook. Mark you calendars now! This is an event not to be missed!